What if we told you that you only needed to stock two ingredients in your pantry to clean most of your house? You better believe it. 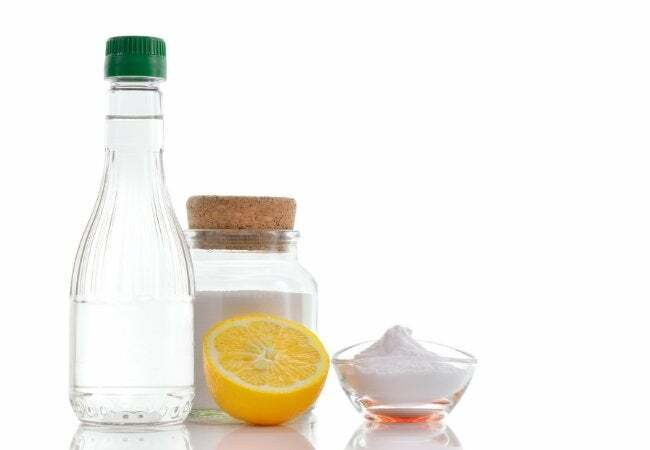 Read on for six ways to use vinegar and baking soda around the house. It’s almost hard to believe: By combining two seemingly mild pantry staples, you can handle most of the tougher messes in your home. But the fact is that, most of the time, baking soda and vinegar are the only one-two punch you need to get your home clean. Seriously! The secret is in how you apply the two, as too much of either can neutralize both. So long as you remember these recipes, though, you can always be ready to clean everyday messes and your home’s grimiest corners. Instead of using harsh chemicals that could potentially damage your pipes, unclog and refresh your drain by pouring in a ½ cup of baking soda and 1 cup of vinegar. Always keep the ratio one-part baking soda to two parts vinegar. The mixture will fizz and bubble, like your favorite middle school volcano science project. Once it dies down, flush the drain with very hot water for five minutes, then run the cold water. Take the opportunity while surface is damp to sprinkle extra baking soda in the basin of the sink, and give it a good scrub using a scrub brush or dish sponge. The slightly abrasive qualities of the baking soda should help to remove stuck-on gunk and stains. Give tough hard water stains the boot! Place a cloth or paper towel soaked with vinegar over the affected area and let it sit for a few hours. Remove the cloth, scrub with a baking soda paste (a mixture of dry baking soda and just enough water to create a paste-like consistency), spritz lightly with vinegar, and wipe clean. With these cleaners up your sleeve—or, rather, sitting in your pantry—you need not cringe when a guest spills a bit of drink on your carpet. Create a paste with baking soda and a small amount of vinegar, then work it into the stained carpet fibers with your fingers. Allow the mixture to sit and dry overnight, then vacuum up any remnants. Before trying out this tip on a large area, test it on small, out-of-sight patch of carpet first. If everything looks kosher, treat the rest of your stain. Baking soda and vinegar’s cleaning and deodorizing properties work wonders in the wash. Add ½ cup of baking soda in with your detergent to help boost its cleaning power. One cup of vinegar poured in during the rinse cycle will help kill bacteria in the load and doubles as a chemical-free fabric softener. The abrasive qualities of baking soda add muscle to your own scrubbing efforts. Nowhere could use that extra “oomph” more than your stained grout! Make a paste using baking soda and water, spritz lightly with vinegar, and immediately scrub and rinse the area. Full disclosure: You’ll probably still need a little bit of muscle—just think of these power players as your line of backup. Dried-on food particles, baked-on grime, and burnt dinner remains all can add time on to your dinner cleanup—but they’re no match for this power couple. Sprinkle baking soda on damp (not wet) pots and pans, spritz with vinegar, then go to town scrubbing with a nylon dish sponge. The slight foaming action will break up some of the tougher stuck-on food, leaving you with a little extra energy after dish duty.